DemoCurmudgeon: Hospital Price Transparency Mind Boggling, Confusing, and proves Private Health Care is a Disaster!!! Hospital Price Transparency Mind Boggling, Confusing, and proves Private Health Care is a Disaster!!! Ryan’s plan would provide tax credits based on age instead of income, encourage the sale of health insurance across state lines and reestablish high-risk pools for people with complex medical conditions. Note: High risk pools are actually government run and funded partially by taxpayers, aided by sky high customer premiums and deductibles, some limits, and they usually end up in the red. What a deal. On Jan. 1, hospitals began complying with a Trump administration order to post list prices for all their services, theoretically offering consumers transparency and choice and forcing health care providers into price competition. It’s turning into a fiasco. Jeanne Pinder, the founder and chief executive of Clear Health Costs, a consumer health research organization said, “The posted prices are fanciful, inflated, difficult to decode and inconsistent, so it’s hard to see how an average person would find them useful.” The data, posted online in spreadsheets for thousands of procedures, is incomprehensible and unusable by patients — a hodgepodge of numbers and technical medical terms, displayed in formats that vary from hospital to hospital. It is nearly impossible for consumers to compare prices for the same service at different hospitals because no two hospitals seem to describe services in the same way. Nor can consumers divine how much they will have to pay out of pocket. Here's one persons revealing take on the new "free market" based posted prices that supposedly will help her shop? “This is gibberish, totally meaningless, a foreign language to me,” said Sara Stovall, 41, of Charlottesville, Va., after looking at price lists for hospitals in her area. She reviewed the price lists for Sentara Martha Jefferson Hospital and for University Hospital, each of which has more than 16,000 items. 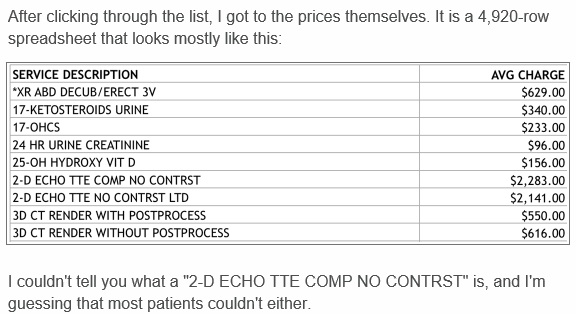 It doesn't show the prices that insurance plans negotiate for the patients that they cover. Hospitals' solution to surprise out-of-network bills: Make physicians go in-network: Some hospitals have turned to a bold strategy to prevent patients from receiving surprise medical bills from out-of-network providers: requiring in-hospital physicians to contract with the same insurers as the hospital. 1. Posting hospital prices only works under a universal health care pricing system, where the nation set a max price for treatment, and lets the private sector compete with lower prices if they choose. 2. Take all the new innovations for saving health care costs now under the ACA, and make it a part of Medicare for all or universal health care. 1. The Trump administration did not define “standard charges.” In later guidance, it said the format was “the hospital’s choice.” “Without a standard definition, patients cannot make accurate comparisons between hospitals,” said Herb B. Kuhn, the president of the Missouri Hospital Association. 2. Even while complying with the new requirement, many hospitals have posted disclaimers warning consumers not to rely on the data. The University of Texas MD Anderson Cancer Center, for example, says that it “does not warrant the accuracy, completeness or usefulness” of the charges listed on its website.